At the Ranch 1975. 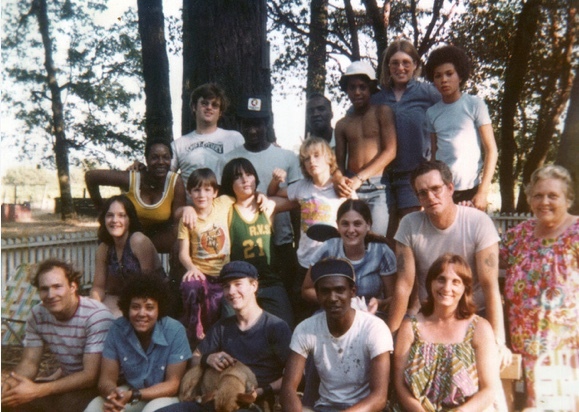 Back row: Connie Frohm Mike Klingman, James Evans, Curtis Winters, unknown, Debby Sines, Mark Wagner Second row: Cindy Cordell, Daren Janaro, Darius Wheeler, William Cole, Mauri Janaro, Don Sly, Claire Janaro’s mother Front row: Chris Rozynko, Diane Wilkerson, Mark Sly, Irvin Perkins, Claire Janaro. We are always looking for additional remembrances and reflections. Please see our invitation below. One Follower of Jim Jones: A Story of Restoration, by Wendy M. Edmonds, Ph.D.
Last modified on October 24th, 2018.